Releasing trigger points is the 'bread and butter of remedial massage and myotherapists. It is one of the first things we study when we start our careers and we never stop honing our skills in treating them. The number of clients we see at Just Knead It who experience pain relating to trigger points is extremely high and we have great results. A trigger point is sometimes known as knot. It is a palpable area in a muscle that is painful on compression and can refer pain to another area of the body. 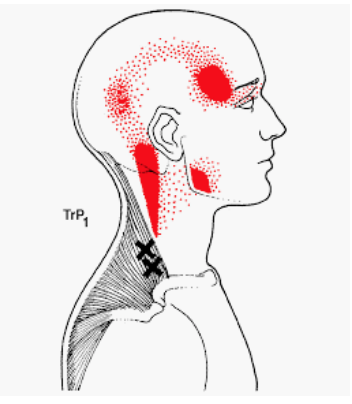 Almost everyone that we see in our Brisbane massage clinics will have trigger points. It just depends on whether or not to they are impacting them in their every day life. Trigger point pain is usually related to pain during activity, although sometimes it can be constant and occasionally it can interfere with sleep. ​Elimination of trigger point pain can be an important component of the treatment and management of musculoskeletal pain in your body. 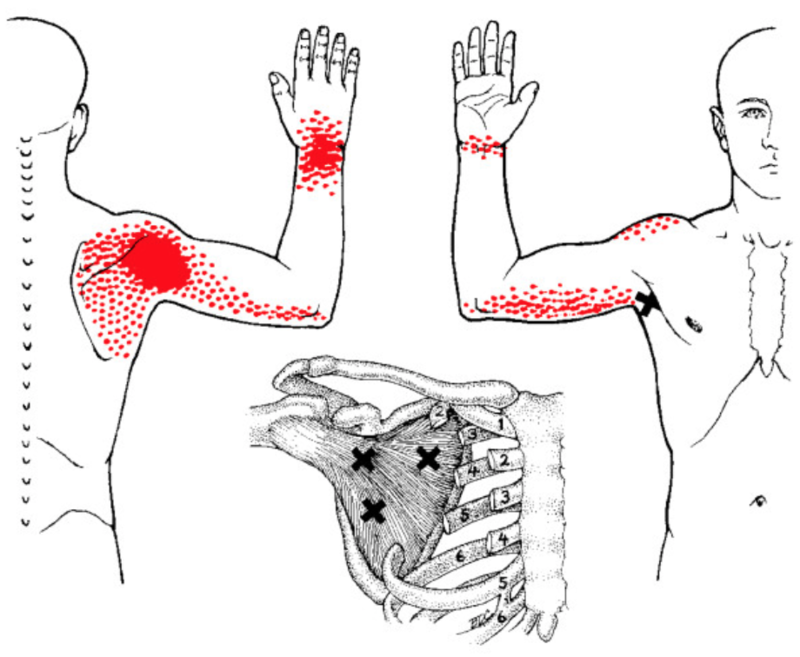 As remedial massage therapists and myotherapists we learn how to identify trigger points in the body. We study something called referral patterns, which are patterns of pain that occur consistently when you apply pressure to a particular trigger point in a muscle. We can use these to identify which muscle groups are causing your pain. This is why often when you come in for a treatment your remedial massage therapist may not exactly treat the spot where you feel like you are sore. Yet when they apply pressure over a spot it reproduces the pain you are experiencing. ​Trigger Point Therapy is a remedial massage technique and is never usually a session on it's own. It is something that is incorporated into every massage or myotherapy session. It involves identify trigger points in the body. To your therapist these feel like palpable nodules or thick muscle tissue, that are tender to touch for you. Pressure is applied over the area to reduce muscle tightness and pain. Your therapist will often ask if this 'refers' anywhere else (which helps them identify if they are on the right spot and if the trigger point is 'active'). Once pressure is applied they will ask you to let them know when the pain starts to dissipate, a sign that the trigger point is starting to release. The exact mechanism behind trigger point therapy is unknown. However the treatment technique is widely used for the treatment of muscloskeletal pain, with good results. Generally trigger point therapy is quite painful and can cause pain around an 8/9 out of 10 on the pain scale. Your massage therapist will generally wait until this pain has dissipated under a 5/10 before they will release their pressure off a trigger point. From our end is also feels like pressure under our thumb is starting to give way. That is why we will often start to comment about the change at the same time as you feel the decrease in pain. To answer this question we need to look at common trigger point referral patterns. Please note that quite often underlying pathologies have similar symptoms to trigger point referrals. That is why your remedial massage therapist will do an assessment and thorough health history before they start treating you, to work out the possible cause of your pain. ​We see this all the time! People come to us complaining of pain in the front of their hip. Typically when doing exercises like running or cycling. It feels like a deep pain up near their groin at the front of their leg. 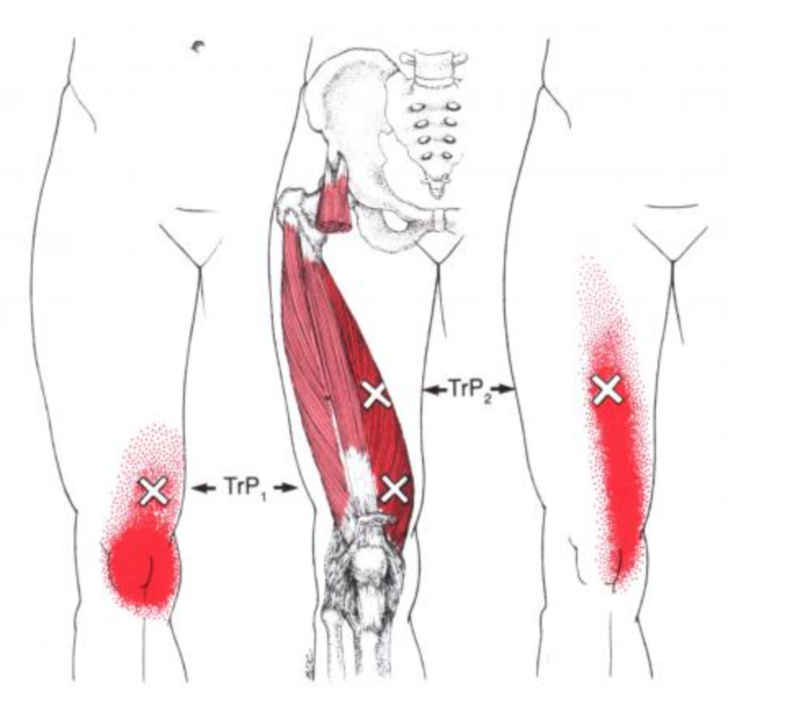 Releasing the iliopsoas muscle can often decrease this pain because of where this muscle refers to in your body. It is also interesting to know that your psoas is responsible for a lot of lower back pain and when you look at where it refers to it is easy to see why. ​We have clients all the time who come in complaining of headaches. The most common thing we will do is look at their range of motion of their neck and upper back and check the tightness in the muscles of their neck and shoulders. If you have a look at the two diagrams these are an example of why! Your SCM - Sternocleidomastoid. The big chunky muscle on the front of your neck that pops out when you turn your head refers to your forehead. 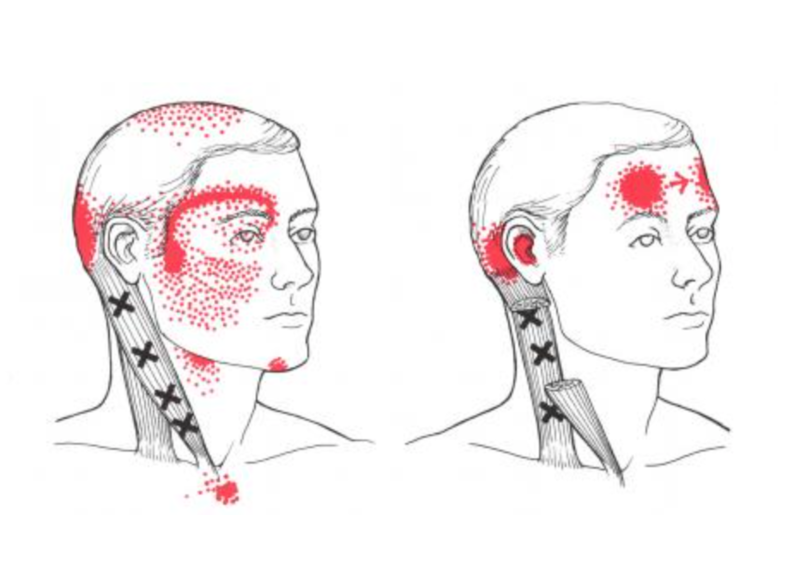 ​Your Upper Traps - refers pain behind your ear, on the side of your head and behind your eye. By releasing these muscles we can often significantly decrease headaches for our clients. Do you ever experience pain in the front of your shoulder? Sometimes your infraspinatus (a muscle on the back of your arm) or your Subscapularis ( a muscle that sits on the inside of your shoulder blade) can cause you pain at the front of your shoulder as well as some radiation down your arm. 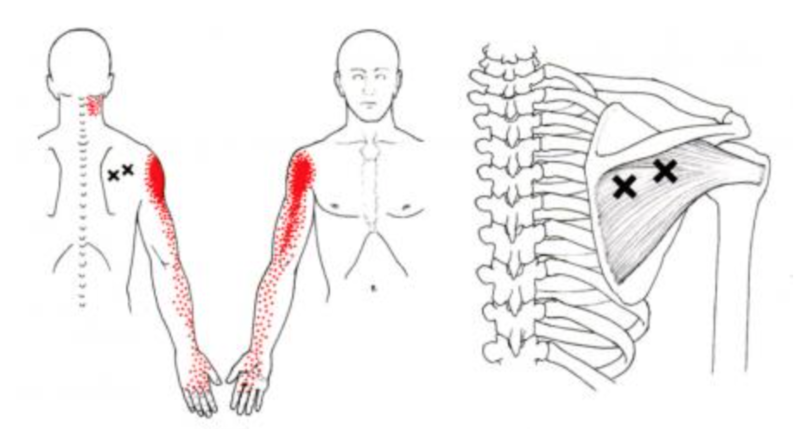 When you look at the referral pattern of both muscles below it is easy to understand why your remedial massage therapist will look at these muscles when you complain of anterior (front) shoulder pain. Sub scap trigger points involve applying pressure through your under arm and onto the front of your shoulder blade.It is an uncomfortable sensation and often difficult to loosen off yourself. Your remedial massage therapist may ask you to rotate your arm downwards towards your hips because as you do this motion the muscle shortens and we can feel it more easily. Knee pain is a common complaint for clients of our Spring Hill and Woolloongabba clinics. Trigger point referral pain can occur on the inside, outside, front or back of your knee. Depending on where you tell us you are experiencing the pain will determine which muscles we look at first. 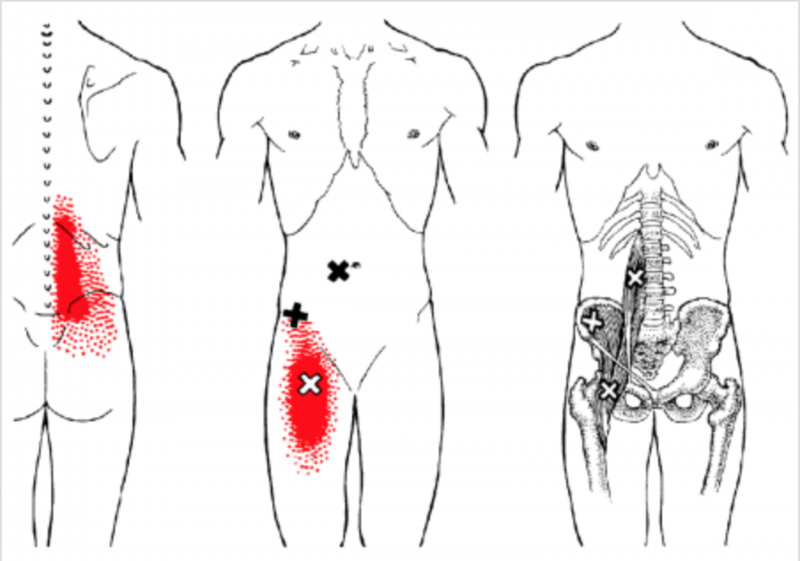 What do remedial massage therapists do to alleviate trigger points? Your remedial massage therapist or myotherapist will either use their thumb, elbow or knuckles to apply pressure onto the trigger point in the muscle. Generally they will target the ones reproducing your symptoms first. They will hold the pressure on the point until they feel a change in the tissue underneath their thumb or elbow. At this point you too should notice a change in the pain sensation in the area. This is a sign that the treatment is working. 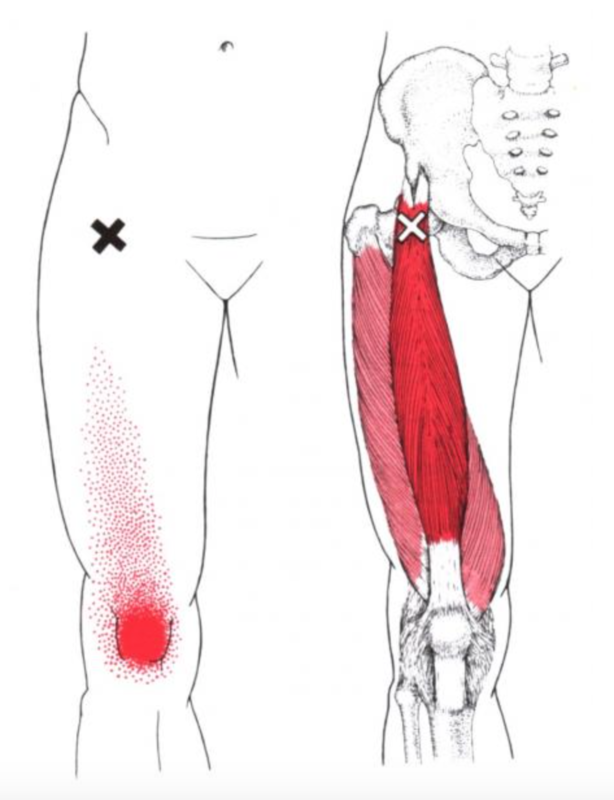 There can be points in muscles that refer but do not follow the normal trigger point referral patterns. There are various explanations for why this occurs however there is not enough research into the mechanism of trigger point referral to fully understand why this happens. Unfortunately even though we know that trigger points exist. there is currently no accepted criteria including biomarkers, diagnostic testing, imaging, etc. for identifying or quantitatively describing trigger points. What can I do to get rid of trigger points? Trigger points are just areas of tight muscle fibres with in a muscle. Anything you can do to lengthen your muscles will help to relieve trigger point pain. Also check out our blog for additional stretching and trigger point recommendations.